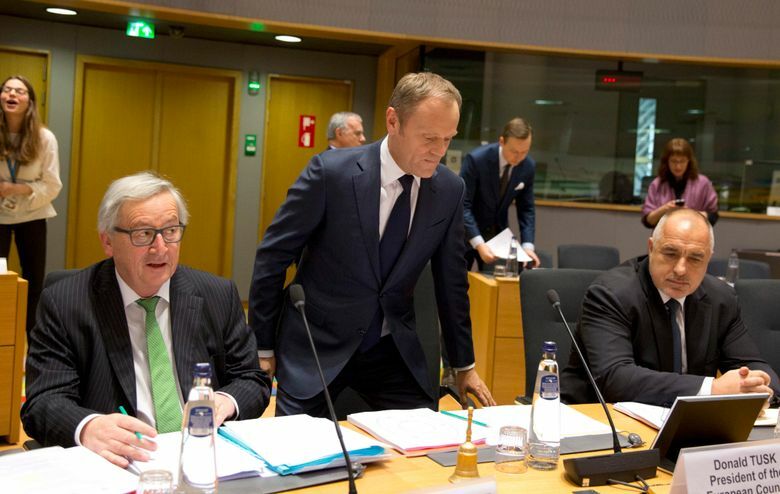 BRUSSELS (AP) — EU Council President Donald Tusk insisted Wednesday that the European Union and Britain were on the cusp of a major Brexit breakthrough over the border in Ireland, where one part of the island will be part of the EU and the other won’t when the U.K. leaves the bloc. On the eve of a two-day summit of EU leaders, Tusk said he was “absolutely sure” that Britain and the 27 EU nations will find a solution to one of the most vexing issues separating the two sides in the negotiations over Britain’s departure. “Trust me, our latest proposal, when it comes to new guidelines, is also acceptable for Dublin and for London,” he said. An agreement on how the border between the Republic of Ireland, which will remain in the EU, and the United Kingdom’s Northern Ireland should be administered has stifled progress in the Brexit divorce talks. Tusk didn’t provide details on what had changed to put a solution at hand. He said the issue will be addressed at the Brussels summit and build on a blueprint sketched out in December. Any similar conflict over the UK’s Rock of Gibraltar on the Iberian peninsula should not present an obstacle, he said. 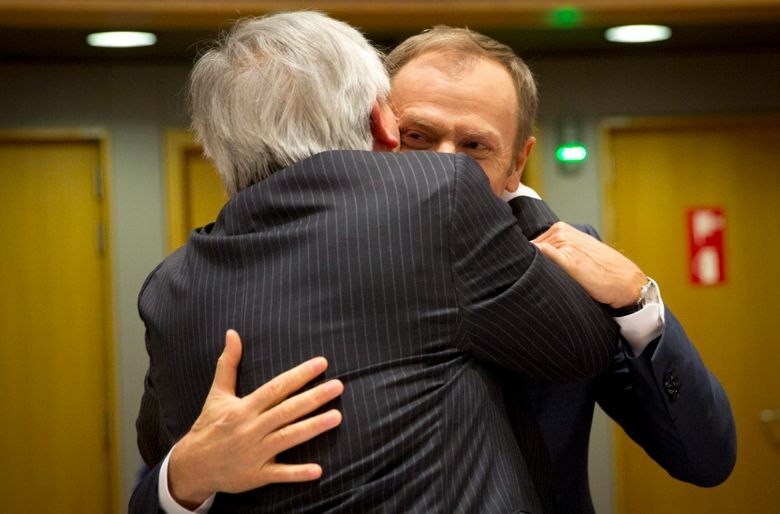 In another sign of potential movement, Tusk also said he is advising the leaders of the remaining EU countries to back a proposed transition deal between the two sides. EU chief Brexit negotiator Michel Barnier and his British counterpart, David Davis, agreed on Monday on the key elements of a deal to soften the transition once Britain leaves on March 29, 2019. In London, meanwhile, pro-Brexit demonstrators hurled fish into the River Thames to protest against continued European access to U.K. fishing waters after Britain leaves next year. Under a draft withdrawal agreement, Britain will remain bound by the EU’s Common Fisheries Policy during a 21-month transition period after the U.K. leaves the bloc in March 2019. That has angered British fishing communities and their representatives, who have long railed against other European countries’ right to fish in British territorial waters. On Wednesday a group of fishermen and politicians boarded a trawler on the Thames near Parliament, where Nigel Farage, former leader of the euroskeptic U.K. Independence Party, dumped a tray of haddock into the river. The protesters say the fish can’t be sold in Britain because of EU rules. Several politicians from Prime Minister Theresa May’s governing Conservative Party put in an appearance at the protest but did not take part in the fish-throwing. More than a dozen Conservative legislators have urged May to tell the other EU leaders that Britain intends to set its own fisheries policy as soon as it leaves. To do so would risk scuttling the withdrawal deal and setting back negotiations on the future economic relationship between Britain and the EU.